1st Quarter: (BR) Corey Sullivan 12-yard pass to Jeff Ciccio, XP good; (KP) Jack Webster 2-yard rush, Cole Baker XP good. 2nd Quarter: (BR) Devante Greaves 2-yard rush, XP failed; (KP) Shane Frommer 65-yard rush, C. Baker XP good; (BR) C. Sullivan 1-yard rush, 2pt pass failed. 3rd Quarter: (KP) S. Frommer 2-yard rush, S. Frommer 2pt rush. 4th Quarter: (KP) S. Frommer 8-yard rush, C. Baker XP good. #1 North Attleboro, 35 vs. #2 Duxbury, 0 – Final – Click here for a recap and photo gallery of this game. 1st Quarter: (NA) Brendan McHugh 3-yard rush, Geoff Wilson XP good; (NA) Chad Peterson 11-yard pass to Jonathan James, G. Wilson XP good. 3rd Quarter: (NA) B. McHugh 1-yard rush, G. Wilson XP good; (NA) Zach DeMattio 18-yard interception return, G. Wilson XP good. 4th Quarter: (NA) Nick Raneri 18-yard rush, G. Wilson XP good. 1st Quarter: (A) Cam Furtado 5-yard rush, Joseph Llanos 2pt rush; (A) Alex Rodriguez 44-yard rush, 2pt rush failed; (A) J. Llanos 12-yard rush, Tyler Evans XP good. 2nd Quarter: (A) J. Llanos 4-yard rush, T. Evans XP good. 3rd Quarter: (A) Justin Cote 17-yard rush, T. Evans XP good. 4th Quarter: (W) Seth Mullen 3-yard rush, S. Mullen XP good. 1st Quarter: (C) James Murphy 9-yard rush, XP failed; (C) Kyle Fitzgerald 76-yard rush, J. Murphy 2pt rush. 2nd Quarter: (C) Johnny Hagan 45-yard pass to Tony Harris, XP failed. 3rd Quarter: (C) Gersom Rivera 8-yard rush, K. Fitzgerald 2pt rush. 4th Quarter: (N) Norwood 4-yard rush, Norwood 2pt pass conversion. 2nd Quarter: (M) Medfield 1-yard rush, XP failed. 3rd Quarter: (F) Devin Hassett 3-yard rush, XP failed; (M) Medfield 19-yard rush, XP failed. 4th Quarter: (M) Medfield field goal. 1st Quarter: (OA) Cam Perron 4-yard pass to Anthony Berksza, XP failed. 1st Quarter: (H) Will Thomas 2-yard rush, XP good. 2nd Quarter: (S) Ruben Gonzalez 9-yard rush, Justin Ly 2pt rush. 4th Quarter: (H) Mike Hannon 5-yard rush 2pt failed; (S) Safety. ATTLEBORO, Mass. – Not every game can be summed up by just one quarter, but the third quarter of Friday’s contest between Attleboro and Franklin essentially told the story. The Bombardiers ran twice as many plays as the visiting Panthers over the first 10 minutes of the frame, and found the end zone three times, turning a close game into a 37-18 runaway win and securing Big Blue a playoff berth. “We made the plays,” said Attleboro head coach Mike Strachan. “We made some adjustments at halftime that worked for us. And just overall I thought we played physical. I think that wore them down a little bit by the end. After going three and out in its first drive, Attleboro’s defense went on a tear over its next three series. Meanwhile, the Panthers were forced into three and out on each of their first three drives of the second half. “That’s the difference, [our defense] was on the field for a long time, and they played as well as they could,” said Franklin head coach Eian Bain. “Offensively we just didn’t execute. It wasn’t that the kids weren’t prepared, we didn’t take Attleboro lightly. We executed great to start. Then we couldn’t run the ball, then we missed open guys. We missed some running lanes. Attleboro’s second drive of the second half almost didn’t get going at all. A bad snap on third down looked like it was going to end the drive, but senior quarterback Cam Furtado (12 carries, 119 yards, two total touchdowns) bought some time and hit Elvin Sam on the sideline, who was ruled in bounds, for an eight-yard gain. Then Furtado’s sneak on fourth down moved the chains. Big Blue committed to the ground game from there, running out of its “tank” formation for the majority of the drive. Justin Cote (16 carries, 94 yards, three total touchdowns) had two carries for a total of 15 yards, Furtado converted a second down with a six-yard run and Cote capped the drive with a seven-yard score. Furtado’s two-point rush made it 16-6 with 5:27 left in the quarter. Another quick stop got the ball back for Attleboro at their own 26-yard line. On the second play of the drive, Furtado went play action but had to escape a pair of rushers in the backfield. He juked past another would-be tackler at the line of scrimmage, found a hole and raced his way for a 73-yard touchdown and a 23-6 lead with 3:56 left in the third quarter. Franklin didn’t gain a yard on its next drive, and was forced to punt from its own 23-yard line. But Attleboro junior Nick Evans broke free and blocked the punt with Myles Haynes jumping on the loose ball. Four plays later, sophomore Joseph Llanos powered his way for a three-yard touchdown, and Tyler Evans‘ extra point made it 30-6 with 1:24 left in the game. Attleboro turned a two-point lead (8-6) into a 24-point advantage in just a matter of four minutes. Franklin took the lead in the first quarter. After its first drive got down to the Attleboro three-yard line, the Panthers’ offense couldn’t punch it in. However, they forced a quick three and out to get the ball out. A 22-yard completion from Jake Noviello (19/40, 228 yards, two touchdowns) to Ryan Driscoll put the Panthers inside the 10-yard line. Three plays later, Noviello linked up with Driscoll again for a four-yard touchdown and 6-0 lead. Attleboro’s defense set the offense up for its go-ahead score. On the eighth play of Franklin’s drive, Furtado – playing safety – picked off Noviello and brought it back to the Franklin 15-yard line. On the third play, Furtado hit Cote for his only other completion of the game for an 11-yard touchdown. Furtado kept it himself for the two-point rush and an 8-6 lead in the second quarter. Attleboro thought it had added to its lead twice late in the second quarter, but penalties erased a pair of touchdowns. First, Furtado hit Cote for an 88-yard touchdown, but a holding penalty at the line of scrimmage and a block in the back down field took the score off the board. Two plays later, Sam got behind the secondary and Furtado hit him for an 89-yard score, but another holding penalty took points off the board. “[Franklin] is a good football team, [Noviello] is one of the best quarterbacks in the league,” Strachan said. “I just think we settled down. The offense needed some time to get going, the defense hung in there. We had two big turnovers, two picks, that came at the right time for us. Franklin tried to orchestrate a second half comeback, scoring a pair of touchdowns. First, Noviello kept it himself for a one-yard touchdown. The Panthers got the ball and needed just three plays to cover 56 yards, with Noviello hitting Evan Wendell on back-to-back 22-yard gains, the latter for six points. Attleboro iced the game when Furtado converted a fourth down run. On the next play, Cote sprinted his way for a 30-yard touchdown to cap the scoring. Attleboro football (3-4 overall, 3-2 Hockomock) will likely be the sixth seed in the D1 South bracket, according to The Boston Herald’s rankings. If that stands, the Bombardiers could be traveling to visit a familiar playoff foe in Xaverian. Franklin (2-5, 1-4) is currently in the ninth spot in the Herald’s rankings, just 0.06 points out of the final playoff spot. However, there are still games to be played Saturday and nothing is official until the MIAA releases its rankings on Sunday or Monday. ATTLEBORO, Mass. 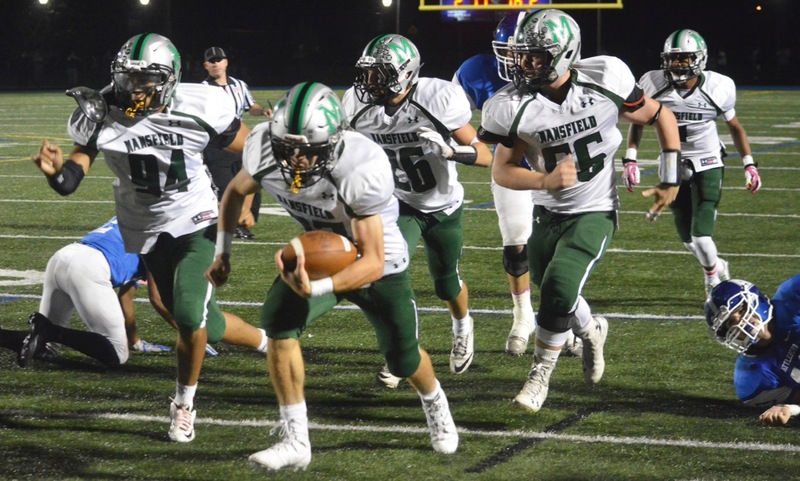 – Before Friday night’s game at Tozier-Cassidy Field, Mansfield was given bad news on the injury front. Having already lost starting linebacker and running back Joe Cox for the season, tailback Danny DeGirolamo and lineman Colbey Eason were both ruled out for the meeting with Attleboro. The Hornets did just that. Mansfield forced four Attleboro fumbles, scoring points off all four turnovers, and rolled to a 31-7 road victory that puts the Hornets alone in second place in the division, keeps them just a game back of league-leading King Philip with one regular season game remaining, and gives them a stronger hold on a home game in the playoffs. Attleboro ran only four offensive plays in the opening 11 minutes, but the game was scoreless when the Bombardiers stuffed a Vinnie Holmes run on fourth and one (ending a 13-play drive) and took over at their own 16 with 49 seconds remaining in the first. Center Matt Corrado, who also plays on the defensive line, was injured on the fourth down play and there was confusion between senior Cam Furtado and his new center. The ensuing snap was early, surprising the quarterback, and was recovered by Chris Graham at the Attleboro 10. Again the Attleboro defense came through with a huge stop. Matt Jimenez and Josh Therrien combined to bring down Aidan Sacco four yards short of the goal line on third down. Mansfield settled for a 26-yard field goal by Michael DeBolt to take the lead. The momentum that the defense gave to the home team was short-lived. A fumble on the second snap of the next drive was corralled by Sacco in front of the Attleboro bench and he took it 27 yards up the sideline for a touchdown to make it 10-0. Another mishandled snap led to Mansfield taking over at its own 48. A run and a penalty later and the Hornets faced second and 11. The Bombardiers were crowding the line of scrimmage when Damani Scott (6-8, 156 yards) dropped back to pass. The junior fired a perfect strike over the top to DeBolt, who pulled in his first career catch without breaking stride for a 53-yard score. Mansfield punted to start the second half, but again Attleboro put the ball on the ground. Ferreira was on hand to recover the loose ball and get the Hornets possession on the Bombardiers 23. Facing fourth and 11, Scott used his legs to scramble for 16 yards and keep the drive going. Two plays later he found Ferreira on the far sideline and the senior wideout somehow pulled it in while staying in bounds for an 18-yard touchdown. After stopping Attleboro at midfield on fourth down, the Hornets tacked on another score to ensure a comfortable fourth quarter. The drive started with a flea flicker, as Scott threw another deep strike, this time to Khristian Conner for 44 yards inside the Attleboro five-yard-line. Sacco capped the drive with a two-yard run, spinning his way inside the pylon. 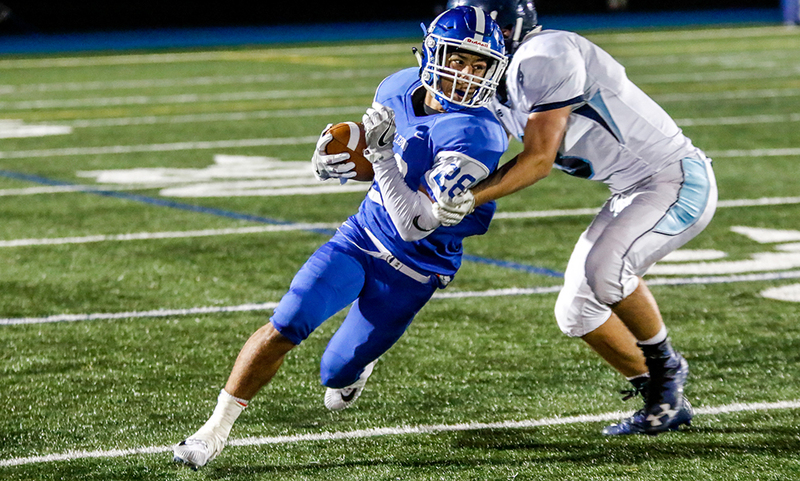 Sophomore Joseph Llanos (nine carries, 88 yards) ensured that Attleboro was not shut out with a 14-yard TD in the final minute of the game, but it was a strong performance by the Mansfield defense. Even without Cox at linebacker, the Hornets limited Furtado to just one completion and 38 yards on 12 carries. Mansfield (5-1, 3-1) will try to keep the pressure on King Philip and sew up a home playoff game next Friday at Alumni Field against Oliver Ames. Attleboro (2-4, 2-2) will look to make sure of a playoff place when it hosts fellow Div. 1 South hopeful Franklin at Tozier-Cassidy. Game of the Week – Football – Click here for a recap and photo gallery from the game. 1st Quarter: (S) Alex Sjoquist 2-yard rush, Josh Cocchi XP good; (NA) Nick Raneri 6-yard rush, Geoff Wilson XP good. 2nd Quarter: (NA) Chad Peterson 4-yard rush, G. Wilson XP good; (S) Justin Ly 65-yard rush, J. Cocchi XP good. 3rd Quarter: (NA) C.Peterson 1-yard rush, G. Wilson XP good. 4th Quarter: (NA) Nathan Pearce 8-yard rush, G. Wilson XP good; (NA) C. Peterson 2-yard rush, G. Wilson good; (S) Johnny Medina 51-yard pass to J. Ly, J. Cocchi XP good. Mansfield, 31 @ Attleboro, 7 – Final – Click here for a recap and photo gallery from the game. 2nd Quarter: (M) Michael DeBolt 26-yard field goal; (M) Aidan Sacco 27-yard fumble return, M. DeBolt XP good; (M) Damani Scott 53-yard pass to M. DeBolt, M. DeBolt XP good. 3rd Quarter: (M) D. Scott 18-yard pass to Hunter Ferreira, M. DeBolt XP good. 4th Quarter: (M) A. Sacco 2-yard rush, M. DeBolt XP good; (A) Joseph Llanos 14-yard rush, Tyler Evans XP good. 1st Quarter: (M) Sean Lehane 42-yard field goal. 2nd Quarter: (F) Mike Henri 4-yard rush, Russell Neale XP good; (M) Colby Pires 32-yard pass to Will Pointer, S. Lehane XP good; (F) M. Henri 4-yard rush, R. Neale XP good; (F) R. Neale 39-yard field goal. 3rd Quarter: (F) M. Henri 31-yard rush, R. Neale XP good. 4th Quarter: (M) Ryan Pearl 4-yard pass to Joey Everett, S. Lehane XP good; (M) W. Pointer 31-yard rush, S. Lehane XP good; (M) Ryan O’Toole 62-yard rush, 2pt failed. 2nd Quarter: (F) Jake Noviello 71-yard pass to Ryan Driscoll, Matt Zucco XP good; (F) Nick Gordon 3-yard rush, M. Zucco XP good; (F) J. Noviello 31-yard pass to Sean Leonard, M. Zucco XP good. 4th Quarter: (T) Noah Leonard 1-yard rush, John Teixeira XP good; (T) N. Leonard 15-yard pass to Jahmeir Lewis, J. Teixeira XP good. 1st Quarter: (KP) Shane Frommer 10-yard rush, Cole Baker XP good. 2nd Quarter: (KP) S. Frommer 12-yard rush, C. Baker XP; (KP) S. Frommer 17-yard rush, C. Baker XP good; (KP) Brendan Lydon 17-yard pass to Andrew Dittrich, Cole Baker XP good. 3rd Quarter: (KP) Ryan Halliday 4-yard rush, Lazar Rogosie XP good; (KP) R. Halliday 5-yard rush, L. Rogosie XP good. King Philip, 0 @ Attleboro, 1 – Final – Attleboro freshman Joey Soucy scored his first career goal inside the first 10 minutes of the game to help the Bombardiers earn their first win of the season. Sharon, 0 @ Foxboro, 4 – Final – Foxboro scored three goals in the opening 10 minutes and never looked back in a win over visiting Sharon. Shane VandenBoom, Nic Biegel, and Matt Rongione each scored to give the Warriors a 3-0 lead. VandenBoom converted a penalty kick in the second half for the final tally. VandenBoom also had an assist, as did keeper Bobby Harrison. Oliver Ames, 4 @ Franklin, 1 – Final – Matt Alvarado scored his first of two goals in the first half and Oliver Ames added three more in the second half to grab two points on the road. Alvarado’s goal, assisted by Nathaniel Cardoza, gave the visitor’s a 1-0 lead at the break. Michael Nikiciuk put OA up 2-0 before the Panthers cut the deficit in half at 2-1. Alvardo and James Gillespie added goals to give the Tigers insurance. Cardoza finished with three assists while Brandin Osborne had one. Mansfield, 4 @ Taunton, 0 – Final – Mansfield scored three goals in the second half to turn a close game into a big win on the road. Cullin Anastasia opened the scoring on a Luke Savoie corner in the 34th minute to give the Hornets a 1-0 lead at the break. Sam Hyland converted off another Savoie corner in the 58th minute to make it 2-0. Four minutes later, Anastasia grabbed his second on a penalty kick. Jackson Murphy capped the scoring in the 70th minute on an assist from Colin Caridi. Nick Ferraz made three saves for his fourth shutout of the season. Milford, 2 @ Stoughton, 0 – Final – Milford scored once in each half to pick up two points on the road at Stoughton. Sophomore Walisson de Oliveira kept his hot streak going, opening the scoring in the first half on a volley on a feed from Joey Madden. Anthony Salvadore added an unassisted tally in the second half for the Scarlet Hawks. MHS head coach Brian Edwards said freshman Leo Coelho and sophomore Bryan Traya both played great in the midfield. Attleboro, 1 @ King Philip, 6 – Final – The Warriors got a combined five goals and six assists from sophomores Avery Snead and Chloe Layne to stay in a tie at the top of the Kelley-Rex standings. Makayla Griffin opened the scoring in the second minute off a Layne assist and then Layne added her first 14 minutes later on a Snead assist. Four minutes later, Layne set up Snead for a third goal. Julia Hayes scored off a 20-yard free kick for Attleboro’s lone goal, but KP added three in the second half. Layne scored on a Snead assist five minutes after the break and then the same combo added another four minutes later. In the 58th minute, Snead added an unassisted goal to wrap up the scoring. Canton, 0 @ North Attleboro, 4 – Final – North Attleboro set the tone early, scoring the opener less than three minutes into the game. Big Red then added one late in the first half and two more in the final five minutes of the game. Kayla Pasquel netted the opener on an assist from Aine Mendonca in the third minute. Haley Guertin, assisted by Leah Jette, made it 2-0 with just two minutes to play in the first half. Emma Gaulin made it 3-0 in favor of Big Red with four minutes left in the game off an assist from Ashlyn Gaulin and then Guertin finished the scoring on a feed from Haley Ferrin with just a minute to play. Emma Noreck earned the shutout in net – “with a smothering defense in front of her,” said NAHS head coach Bill Wallace. Foxboro, 6 @ Sharon, 0 – Final – Foxboro took a 2-0 lead into halftime and broke the game open with four goals in the second half. Mackenzie Fraser netted a pair of goals for the Warriors while Lily Sykes, Shaina Abbott, Katelyn Mollica and Yara Fawaz each scored once. “We played with a lot of energy and passion today,” noted Foxboro head coach Katie Stalcup. Franklin, 1 @ Oliver Ames, 2 – Final – Jackie Mills scored a last-minute goal, her second of the game, to secure a dramatic two points for the Tigers. Franklin had a chance from the penalty spot in the second half, but OA defender Maggie Ault stepped in between the pipes (starting goalie Regan Benton was forced to the bench with a yellow card) and made the save. Anabella Walsh and Abby Reardon had assists for the Tigers. Taunton, 0 @ Mansfield, 4 – Final – The Hornets stayed in a first-place tie atop the Kelley-Rex behind a Stephanie Kemp brace. Cassidy McMahon added a goal and two assists and Emily Vigeant scored one for the Hornets. Stoughton, 1 @ Milford, 5 – Final – Milford senior Leeanne Kibbee and Ashleigh Starks each scored a pair of goals as Milford cruised to a win at home. Senior Maggie Boyle also found the back of the net while freshman goalie Carly Ferreira notched her first career win. Mia Greene had the goal for the Black Knights. King Philip, 3 @ Attleboro, 1 – Final – King Philip bounced back from an opening set loss to earn a win on the road, beating Attleboro 19-25, 25-15, 25-18, 25-9. Sydney Phillips led the offense with 11 kills, Michaela Palumbo had five kills with five service points, including four aces and Rachael Veillieux had 18 service points, including eight aces. Kat Kmetz added 10 service points and five kills and Grace Ely chipped in with five kills. North Attleboro, 3 @ Canton, 2 – Final – Despite falling behind 2-0, North Attleboro rallied with three straight wins to pick up a big division win on the road (20-25, 22-25, 25-15, 25-8, 15-8). Amelia Murphy led the offense with 22 kills and four blocks while classmate Kezia De La Cruz had 15 kills and four aces. Leah Marceau put the offense in motion with 28 assists. For Canton, Nicole Brown had 20 assists, 11 digs, and four kills, Hannah Jerrier had 10 kills, and Megan McDonough had 15 digs and a pair of aces. Oliver Ames, 0 @ Franklin, 3 – Final – Franklin junior Lauren McGrath spread the ball around in the Panthers sweep of the Tigers, recording 29 assists as well as three kills and two aces. Maggie Doyle (four blocks), Meaghan Maguire (two blocks) and Hailey Sanders (block) each had six kills for Franklin. For Oliver Ames, Katie Flynn had seven kills while junior Sadie Homer had 22 serve receptions and 10 digs. Mansfield, 3 @ Taunton, 0 – Final – Mansfield snapped its three-game skid with a 25-23, 25-13, 25-14 win on the road at Taunton. Meg Hill had a team-high 18 kills while Julia Harrison added 10 kills. Emma Ascoli had 28 assists and 10 service points and Lexi Gardner had 17 service points and four kills. Milford, 1 @ Stoughton, 3 – Final – Stoughton picked up its 13th win of the season with a 3-1 decision over visiting Milford. Senior Val Whalen led the way for the Black Knights with 13 kills, 14 digs, and nine aces while Junior Hanna Holden chipped in with 13 digs and eight assists. Canton, 170 @ Sharon, 176 – Final – Canton’s Thomas Singleton and Sharon’s Corey Carter shared match medalist honors, each carding a round of 40 but the Bulldogs came away with a close win. Joey Vaughan shot a 41 whole Chris Lavoie added a round of 44 in the win. Matt Grosser shot a round of 44 for the Eagles. Oliver Ames, 145 @ King Philip, 159 – Final – Oliver Ames seniors Ryan McGarry and Mark Bissonette earned co-medalist honors, each carding a low-round of 35 to lead the Tigers to their 12th win of the season. Nolan Donze shot a 37 and Matt Kelley added a round of 38 in the win. Taunton, 100 @ New Bedford, 73 – Final (Stableford) – Taunton picked up a win on the road, beating New Bedford in a match decided by Stableford points system. Jack Patneaude led the way with a 42 for the Tigers while Spencer Andrews shot a 43 and Jack Giebel carded a 44. ATTLEBORO, Mass. 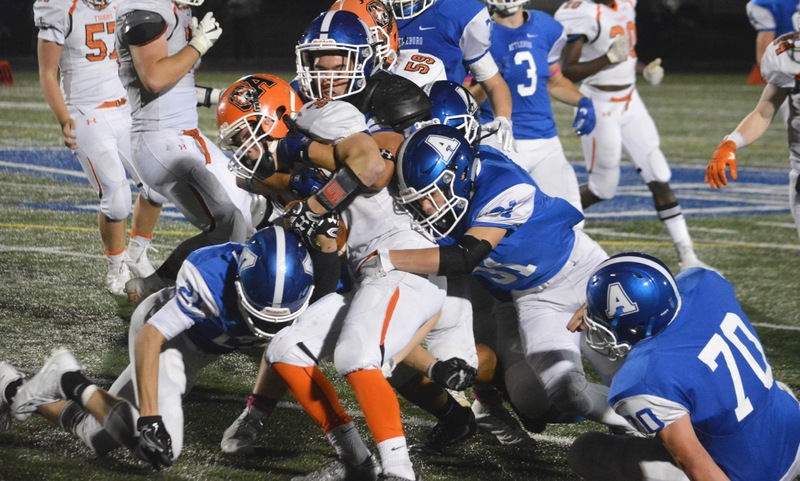 – During the first three weeks of the season, Attleboro struggled to live up to the preseason hype against a difficult stretch of opponents and a roster in flux from a series of injuries that ensured trainer Wes Pondolfino was earning his paycheck. The Bombardiers lost key players on both sides of the ball and lost the opening three games. But, over the last two weeks, the injured players have returned to the field and Attleboro has looked like the explosive team that many predicted. On Friday night at Tozier-Cassidy Field, the Bombardiers put it all together, dominating in all three phases and posting 38 points in the first half of a 44-0 victory over Oliver Ames. Attleboro took control right from the opening kick-off, marching 58 yards in eight plays to take a quick lead. Alex Rodriguez had a pair of carries for 31 yards and senior quarterback Cam Furtado scored from 11 yards out. Furtado then took a hit, but completed the conversion pass to Nathan Barboza to make it 8-0. The Bombardiers quickly got the ball back when running back Anthony Berksza fumbled trying to stretch a screen pass into extra yards, Desmond Woodson recovered for the hosts, but, after Furtado hit James Weir (one of the players back from injury) for 12 yards down to the OA 10, the Tigers held firm and forced a turnover on downs. OA could not build momentum off the defensive stand, as Curtis Cann’s third down deep pass was intercepted by Josh Therrien. Attleboro moved the ball rapidly down field, showing balance between run and pass. Justin Cote extended the lead when he cut back against the grain on a sweep to the left and weaved his way for a 23-yard scored. Furtado got the pylon at full stretch for another conversion. Matt Corrado stuffed Berksza (12 carries, 63 yards) behind the line and Qualeem Charles batted down a Cann pass to end the next OA drive. Elvin Sam returned the punt 28 yards to the OA 42 and Attleboro again went to work offensively. This time the Bombardiers got to the end zone through the air, as Furtado (4-9, 70 yards) hit Cote in stride for a 41-yard score and added another conversion run. On the ensuing kick, the up-back Darnele Ryan, who had a strong game for the OA defense, could not handle the bounce and Rodriguez was first to the loose ball for Attleboro. Furtado (nine carries, 35 yards) went 15 yards on the first play and then sophomore Joseph Llanos went straight up the middle for 12-yard touchdown. Berksza broke a 19-yard run on the first play of the next OA drive, but Charles pressured Cann on third down and the pass fell incomplete. Berksza’s punt was fielded on a short hop by Sam at his own 26. The senior wideout took the ball straight up the middle and then cut to the far sideline where he found an opening to take it all the way to the end zone to make it 38-0. With an eye towards next week’s showdown with the Hornets, Attleboro turned to its bench in the second half, giving some of the younger players an opportunity. Dante Williams (eight carries, 46 yards) was one of those and with 1:46 remaining he punched it in from three yards out to put the icing on a dominant performance by the Bombardiers. Attleboro (2-3, 2-1) remains a game behind King Philip in the race for the Kelley-Rex division crown. The Bombardiers are currently tied with Mansfield and will host the Hornets next Friday night. Oliver Ames (2-3, 1-2) will try to play spoiler next week with a trip to Macktaz Field to take on league-leading KP. Oliver Ames, 0 @ Attleboro, 44 – Final – Click here for a recap and photo gallery from this game. 1st Quarter: (A) Cam Furtado 11-yard rush, C. Furtado pass to Nathan Barboza 2-point conversion. 2nd Quarter: (A) Justin Cote 23-yard rush, C. Furtado 2-point conversion rush; (A) C. Furtado 41-yard pass to J. Cote, C. Furtado 2-point conversion rush; (A) Joseph Llanos 12-yard rush, Tyler Evans XP good; (A) Elvin Sam 74-yard punt return, T. Evans XP good. 4th Quarter: (A) Dante Williams 3-yard rush, Conversion no good. 2nd Quarter: (S) Alex Sjoquist 28-yard rush, XP missed. 3rd Quarter: (S) A. Sjoquist 36-yard rush, 2pt failed. 1st Quarter: (F) Devin Hassett 14-yard pass to Jake Addeche, Russell Neale XP good. 2nd Quarter: (NA) Chad Peterson 7-yard pass to Nick Raneri, Geoff Wilson XP good. 4th Quarter: (NA) C. Peterson 36-yard pass to Brendan McHugh, G. Wilson XP good; (F) D. Hassett 13-yard pass to Jack O’Donnell, XP blocked. 1st Quarter: (KP) Shane Frommer 1-yard rush, Cole Baker XP good. 2nd Quarter: (F) Jake Noviello 55-yard pass to Sean Leonard, Matt Zucco XP good; (F) J. Noviello 1-yard rush, M. Zucco XP good. 4th Quarter: (KP) Brendan Lydon 31-yard pass to Tom Madden, C. Baker XP good; (KP) C. Baker 18-yard field goal. 1st Quarter: (T) Noah Leonard 70-yard rush, XP blocked; (M) Danny DeGirolamo 6-yard rush, XP missed. 2nd Quarter: (M) Mike DeBolt 34-yard field goal; (T) N. Leonard 10-yard pass to Collin Hunter, John Teixeira XP good. 3rd Quarter: (M) N. Leonard 10-yard pass to Jahmeir Lewis, XP blocked; (M) Damani Scott 10-yard pass to Hunter Ferreira, M. DeBolt XP good; (M) D. Scott 20-yard pass to H. Ferreira, M. DeBolt XP good. 4th Quarter: (M) Vinnie Holmes 3-yard rush, M. DeBolt XP good; (M) Aidan Sacco 31-yard rush, M. DeBolt XP good. Attleboro, 0 @ Milford, 3 – Final – Milford head coach Brian Edwards made a tactical change, moving Walisson de Oliveira up the pitch into a striker’s role and the sophomore responded with his first career hat trick. De Oliveira opened the scoring in the 10th minute on a feed from Anthony Salvador. The Hawks doubled the lead in the 60th minute when de Oliveira converted a chance from Joey Madden. The sophomore capped his scoring with a shot from nearly 30-yards out in the 75th minute. Edwards added that Filipe Da Silva also played a great game up top for the Scarlet Hawks. Oliver Ames, 3 @ Foxboro, 1 – Final – Oliver Ames set the tone early, scoring inside the first minutes, to take two points on the road at Foxboro. Matt Alvarado took a feed from Cam Vella to put the visitors ahead. Foxboro’s Shane VandenBoom tied the game 10 minutes later but OA went back ahead in the 23rd minute when Alvarado set up Mason Galbato. Jack Sheldon netted an olimpico – directly off a corner kick – in the 50th minute to give the Tigers a two-goal cushion. Franklin, 2 @ Stoughton, 0 – Final – Franklin sophomore Donny Tappin factored into both of the Panthers’ goals, helping take two points on the road at Stoughton. Tappin opened the scoring on a feed from classmate Jacob Cummings and then set up senior Will Conley for the Panthers’ second tally. King Philip, 2 @ Sharon, 1 – Final – Just two minutes after Sharon equalized the game, King Philip netted the game-winner to take two points on the road. Senior Tyler Mann opened the scoring in the 66th minute, netting a shot from outside the area to put the Warriors up 1-0. Sharon’s Spencer Hall leveled the match in the 73rd minute but Thomas Lugten found the winner for KP off a cross from Zac White in the 75th minute. Mansfield, 0 @ North Attleboro, 1 – Final – North Attleboro senior Gabe Pinhancos scored the lone goal of the game just under five minutes into the second half to give the Rocketeers a berth in the MIAA state tournament. Ryan Pasquel played a low service on a corner, which was dummied by Zach Matracia. Pinhancos then latched onto the ball inside the area to beat the keeper. Milford, 1 @ Attleboro, 1 – Final – Juliana France scored the goal for the Hawks to earn a point on the road. Foxboro, 1 @ Oliver Ames, 3 – Final – Jackie Mills scored a hat trick for the Tigers, while Sofia Masciarelli, Anna Tempestoso and Abby Reardon had assists for OA. Mackenzie Fraser scored the lone goal for the Warriors. Sharon, 0 @ King Philip, 4 – Final – Chloe Layne scored a brace and recorded an assist and Ally Stanton had a goal and an assist for the Warriors. Layne opened the scoring in the eighth minute off an assist by Hanna Balunos and then assisted on a goal by Avery Snead four minutes later. In the 55th minute, Layne scored her second on an assist by Stanton and then Stanton wrapped up the win with a 20-yard strike to the far post assisted by Abby Baker. King Philip, 1 vs. Algonquin, 1 – Final – King Philip’s Alli Meehan scored the lone goal for the Warriors, converting an assist from Liz Furfari. Taunton, 1 @ Canton, 3 – Final – After splitting the first two games, Canton earned two straight wins to get the 3-1 (25-19, 23-25, 25-11, 25-19) win over Taunton. Rose Hazam had a strong all-around game with eight kills, six aces and 13 digs for the Bulldogs while Hannah Jerrier added 11 kills. Nicole Brown (four kills) paced the offense with 21 assists while Megan McDonough, Sofia Connor and Julia Minichiello had strong performances defensively for Canton. Oliver Ames, 3 @ Foxboro, 0 – Final – The Tigers picked up a sweep (25-14, 25-18, 25-16) on the road to grab the team’s fifth win of the season – all coming in the last six games. Sophomore Ally Kemp led OA with 25 assists, junior Sadie Homer added 13 digs, and senior Kayla Raymond finished with seven kills and a pair of blocks. OAHS head coach Chelsea Cunningham added that junior Caitlin Cavanaugh played a great game on the outside. Franklin, 1 @ Stoughton, 3 – Final – After falling 25-27 in the first set, Stoughton’s Molly Turner started the second game with 10 service points, including four aces, and the Black Knights never looked back in rattling off three straight wins. Seniors Jordan Motley, Val Whalen and Vicky Ramos combined for over 30 kills for Stoughton. Lauren Lockhart led Franklin with eight kills while Meaghan Maguire (three blocks) added seven kills and Maggie Doyle (five blocks) had six kills. Lauren Bissanti finished with seven digs and three aces for the Panthers. Mansfield, 0 @ North Attleboro, 3 – Final – North Attleboro was pushed to the limit for the first two games, but prevailed with wins in both and went on the complete the 3-0 (26-24, 25-22, 25-16) sweep of Mansfield. Anna Caristi recorded a team-high 11 kills for the Rocketeers while Kezie De La Cruz had 10 kills, three aces and two blocks. Meg Hill led Mansfield with 13 kills, Julia Harrison added six kills and 10 digs and Jolie O’Neil had 10 digs and 11 service points for the Hornets. King Philip, 3 @ Sharon, 0 – Final – King Philip picked up a sweep on the road, leaving Sharon with a 25-12, 25-15, 25-13 win to improved to 11-1. Sydney Phillips had eight kills, four digs, three aces and 10 service points, Michaela Palumbo added five kills and Julianne Rando finished with seven digs and eight service points, including an ace. Both Elise Pereira (six digs, two aces, eight service points) and Rachael Veilleux (nine service points, five aces) had strong serving performances for KP. Attleboro, 160 @ Oliver Ames, 145 – Final – Oliver Ames improved to 8-0 with a win over visiting Attleboro in a Kelley-Rex showdown. Ryan McGarry earned match medalist honors, carding a low-round of 35. Nolan Donze (36), Thomas Walsh (37) and Mark Bissonette (37) also had strong days for the Tigers. Corey McKenna led Attleboro with a team-low round of 37. 1st Quarter: (OA) Anthony Berksza 4-yard rush, 2pt rush failed; (OA) A. Berksza 11-yard rush, 2pt rush failed. 2nd Quarter: (T) Noah Leonard 2-yard rush, XP failed. 3rd Quarter: (T) N. Leonard 36-yard pass to Collin Hunter, John Teixeira XP good. 2nd Quarter: (A) Cam Furtado 2 yard rush, XP failed; (KP) Shane Frommer 35-yard rush, Cole Baker XP good; (KP) Nick Kerr 1-yard rush, C. Baker XP good; (KP) S. Frommer 10-yard rush, C. Baker XP good. 3rd Quarter: (KP) Brendan Lydon 1-yard rush, XP failed; (A) Joseph Llanos 15-yard rush, C. Furtado 2pt pass to Mike Strachan; (KP) S. Frommer 59-yard rush, B. Lydon 2pt pass to Andrew Dittrich. 4th Quarter: (KP) B. Lydon 5-yard pass to Tom Madden, C. Baker XP good. 1st Quarter: (M) Will Pointer 51-yard rush, Sean Lehane XP good; (C) Alec Ragusa 1-yard rush, XP failed. 3rd Quarter: (M) Jack Felander fumble recovery in end zone, S. Lehane XP good; (C) Johnny Hagan 35 yard pass to Tony Harris, 2pt failed. 4th Quarter: (M) Ryan Pearl 1 yard rush, S. Lehane XP good; (C) A. Ragusa 5 yard rush, Owen Lehane XP good. 2nd Quarter: (F) Devin Hassett 15-yard pass to Phil Dure, XP no good; (S) Ruben Gonzalez 89-yard kickoff return, XP blocked; (F) Mike Henri 14-yard run, Russell Neale XP good. 3rd Quarter: (S) Alex Iverson 52-yard run, 2-point conversion no good. 1st Quarter: (F) Jake Noviello 28-yard pass to Sean Leonard, Matt Zucco XP good. 3rd Quarter: (M) Damani Scott 3-yard rush, Mike DeBolt XP good; (M) Joe Cox 8-yard rush, M. DeBolt XP good. 4th Quarter: (F) J. Noviello 67-yard pass to Ryan Driscoll, XP blocked. Attleboro @ Norton – Postponed, TBD. Taunton, 4 vs. Coyle & Cassidy, 2 – Final – Lexi Faria, Alex Wapenski, Angie Lynch and Kasey Colvin scored the goals for the Tigers, helping Taunton claim its first city championship in 24 years, according to coach Edith Dixon. Amanda Pugh, Meg Mazerolle, and Emily O’Gara had assists for Taunton and Grace Pimenta made eight saves. Attleboro @ North Attleboro – Postponed, TBD. Attleboro, 0 @ North Attleboro, 3 – Final – North Attleboro bounced back from its first loss of the season with a 25-14, 25-15, 25-14 win against Attleboro. Amelia Murphy registered 10 kills and two aces while Tori Melanson notched seven kills and two blocks. Oliver Ames, 3 @ Bridgewater-Raynham, 0 – Final – Oliver Ames recorded its first win of the season with a 25-20, 25-8, 25-13 decision on the road. Senior Kayla Raymond led OA with nine aces, six kills and two blocks. Junior Sarah Litwack added 22 assists and two aces, junior Sadie Homer had six aces and 10 digs, and senior Emma Petrillo finished with 10 kills and six digs. Franklin @ King Philip – Postponed, TBD.